Dan Dee Teddy Bear Plush. When putting the baby to sleep "Bare is Best" in the crib. Big plush Heart with PRINCESS embroidered on front. Pink with white accents. the year 2007 embroidered on foot. 21" from tip of head to tip of foot. 1980 Dan-Dee Imports Christmas Plush Mouse In Stocking Ground Nutshell Filled 8"
Filled with shredded synthetic cotton & ground nut shell. This is in good condition with thee. Dan Dee red BEAR with a leopard scarf, stuffed animal toy. Size approx. : 21". Great condition. 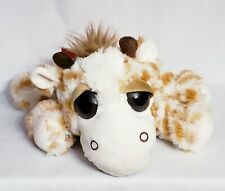 Dan Dee Collector's Choice Plush Giraffe 11" Stuffed Animal Great Condition . Condition is Used, great condition. Please see photos for details. Shipped with USPS First Class Package. Ships from a smoke free and pet free environment. 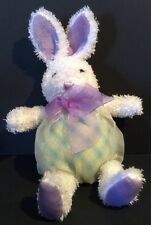 Dan Dee Collectors Choice Bunny Rabbit Purple Tipped Velvet Pads Plush 12"
Nose is Purple stitching all in beautiful condition. Smoke free, pet free. Dan Dee Sock monkey with bunny rabbit ears. Dan Dee Clown Plush Bean Bag Soft Toy Stuffed 10"
Type: plush clown with beans in bottom. Condition:good condition no noted flaws. Size: approx 10" tall. This is a large red and white striped sock monkey with a big red heart. It is in very good condition. It seems to be filled with foam beads. Pale Sandy Fawn Shade. Girl Teddy Bear. Good Pre-Owned Condition. Condition grade A-, see photos. I see no flaws. Golden shiny fur bear wearing red hat with feather and red bow by Dan Dee Collector's Choice. I DO appreciate it! By purchasing this item, you understand and agree to this stipulation. Colorful OWL with GLITTERY SPARKLES. DAN DEE Collector's Choice. Suitable for Boy or Girl. Ready for LOTS OF HUGS and KISSES! It stands approx. 7" tall and 6" across. Sits 10" Tall, and 8' at widest point. Press bunny tummy to see and hear him sing Easter Parade. AA batteries required (not included). Here is a Navy Blue Velvet Jewelry Box and Brown Teddy Bear Set by Dan Dee Collector's Choice. The bear is 7" tall and is attached to a small 5.5" x 4" x 3" jewelry box. It is in Very good condition. Shape: BUNNY RABBIT. Maker: DAN DEE. Color: MULTI. Excellent Like New condition. Clean and ready to display or use. FREE GIFT WRAP FROM NOVEMBER - DECEMBER AND YEAR ROUND UPON REQUEST! Big fluffy soft plush gorilla. Dan Dee Collectibles. Giant Love Monkey. With a rose in his mouth holding a stuffed heart with love printed on it. size: 2 feet tall. Color: black and red. Tested Working (2 AA Batteries Included). Press the Hand and the Monkey will Rock back and forth as his cheeks Light up and the song is played. This Smiling SANTA PUP stands approx. 7" tall and 7" across. Standing PLUSH PUPPY DOG with Santa Suit and Hat. DAN DEE Collector's Choice. Suitable for Gift Giving - Boy or Girl. Washing instructions listed in English and Spanish. Dan Dee Collectors Choice Blue White Sock Monkey Knit Plush Stuffed 10"
Gently Pre-owned, Dan Dee Collectors Choice Blue White Sock Monkey Knit Plush Stuffed 10". DanDee Sound and Motion Toy. Sings “Hound Dog”. Watch Video. BOY GIRL EASTER BASKET BUNNY w Purple Ear PINK SOCK MONKEY 13" PLUSH TOY Dan Dee. A Plush Knit SOCK MONKEY. with PINK FLORAL SHIRT with PURPLE EASTER BUNNY EARS. SOCK MONKEY stands approx. 13" tall with EARS x 8" wide x 2 1/2 deep". Singing Gorilla Plush. Sings "Sooner or Later". batteries included. wearing clear fireman slicker with hearts. NEW FOR GIRL Dan Dee PINK SOCK MONKEY w SNOWFLAKES 10" Plush Toy CHRISTMAS FUN. ~ PINK & GREEN with SNOWFLAKES and ACCENTS ~. A Plush Knit SOCK MONKEY. SOCK MONKEY stands approx. 10" tall x 7" wide x 2 1/4 deep". PUFF COAT PAL. MOOSE with Red Plaid Shirt and RED Overalls. From Dan Dee. "Santa's Helpers" is sewn in GREEN on the front of the Bibs. This PLUSH is SOFT and FLUFFY and PUFFY. It stands approx. 14" tall with antlers (11" sitting) and 10" across. FOR BOY & GIRL Dan Dee BLUE SOCK MONKEY w SNOWFLAKES 10" Plush Toy CHRISTMAS FUN. ~ BLUE with RED & WHITE SNOWFLAKES and ACCENTS ~. A Plush Knit SOCK MONKEY. SOCK MONKEY stands approx. 10" tall x 7" wide x 2 1/4 deep". FOR BOY OR GIRL Dan Dee CHRISTMAS WHITE SOCK MONKEY w SNOWFLAKE 10" Plush Toy. A Plush Knit SOCK MONKEY. Great gift idea for the SOCK MONKEY LOVER in your life. SOCK MONKEY stands approx. 10" tall x 7" wide x 2 1/4 deep". PUPPY DOG Teddy Bear. COLLECTIBLE NWT "BABY'S 1st CHRISTMAS" PUPPY DOG 7" BLUE SLEEPER Plush Toy BOY. This Soft Plush features a Blue Sleeper with "Baby's 1st Christmas" embroidered on the front. BABY'S 1st CHRISTMAS. NEW FOR BOY GIRL Snowman Yellow Sleeper 7" Plush Toy BABY'S FIRST 1st CHRISTMAS. This Soft Plush features a Yellow Sleeper with "Baby's 1st Christmas" embroidered on the front. YELLOW SNOWMAN Teddy Bear Style. For Boy Girl HALLOWEEN MONSTER 8" Plush Toy GREEN FRANKENSTEIN BLUE PANT Dan Dee. FRANKENSTEIN GHOUL. From Dan Dee 8" Halloween Plush. Perfect for the FRIGHTFUL HALLOWEEN! BLUE PANTS and SUSPENDERS. NEW VAMPIRE BAT HALLOWEEN 8" Plush Toy DRACULA BLUE w PURPLE WING CAPE Dan Dee. VAMPIRE DRACULA. PURPLE BAT WINGS CAPE. From Dan Dee 8" Halloween Plush. Perfect for a FRIGHTFUL HALLOWEEN!